Yearly community youth football camp hosted by New York Jets OT Kelvin Beachum held in the off season of 2018. Successful weekend started Friday night with dinner and basketball at Beachum's parents house. Saturday we spent the day at the camp, and finished the evening with 4-wheelers and dinner. All with the support from a few of his friends from the NFL. Players included Chris Banjo - New Orleans Saints, Antwon Blake - Tennessee Titans, James Carpenter - New York Jets, Chris Carter - Washington Redskins, Anthony Johnson - Indianapolis Colts , Patrick Omameh - New York Giants, Jermey Parnell - Jacksonville Jaguars, Alfred Johnson - San Francisco 49ers, and Ja’Gared Davis - Calgary Stampeders of the Canadian Football League. My top 12 images have been submitted for the yearly Hall of Fame Photo contest for working NFL photographers. Winners will be announced at the beginning of the 2018 NFL season. Thank you to the Lewis Agency for the invite to photograph Pittsburgh Steelers OLB Bud Dupree 1st youth community football camp. Yearly community youth football camp hosted by New York Jets OT Kelvin Beachum held in the off season of 2017. 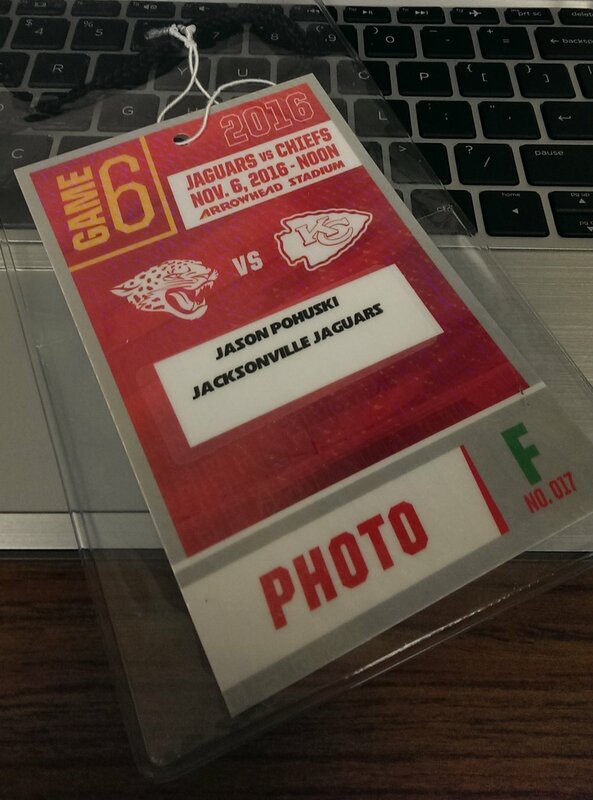 So much fun covering Kelvin Beachum & the Jacksonville Jaguars. Here are a few of my favorite images, more to come. My top 12 images have been submitted for the yearly Hall of Fame Photo contest for working NFL photographers. Winners will be announced at the beginning of the 2017 NFL season. Jim Biever, son of longtime team photographer Veron Biever retires from the Green Bay Packers on June 8, 2016. Back in October 2010, I had the privilege of photographing the Packers vs Dolphins game in Green Bay. A few days prior to the game, Vernon passed away at the age of 87. All of the photographers at the game decided to honor Vernon afterwards by meeting in the middle of the field for a moment of silence. From what I'm told to this day, Jim Biever talks about this as being one of his most memorable days photographing. I have to say, this was one of my most memorable days as well. To be part of something special, honoring one of the greatest photographers in the league. I was one of the few photographers to have my image featured in the 2015 Sports Illustrated Special Commemorative Issue honoring Derek Jeter. Millions of photographs taken of Derek over the years, and the editors selected one of my shots. I'm very proud to have my name in this edition. The Hall of Fame's prestigious contest is open to photographers ordinarily on assignment to cover theNFL games taken during the season, that include the Super Bowl and the Pro Bowl were eligible. A few sample images in print around the world. Publications include Sports Illustrated, ESPN Magazine, New York Post, US Weekly Magazine, Sporting News Magazine, SHAPE Magazine, Bride Magazine and ABC Network Television. Published in Sports Illustrated - Ohio State running back "Zek" Elliott, now a member of the "Dallas Cowboys". I love walking into a bookstore, and flipping the pages to discover a few of my pics published. My favorite part about photography is when I get the chance to just hang out with some NFL players for the day. I was invited to photograph Ross Ventrone AKA "Rusty Benson" and LaRod Stephens-Howling former Pittsburgh Steelers. We spent the day at the gym, and my agenda was to just capture their life for a few hours. Shooting a NFL game with my GoPro Hero 4 is just another tool in my tool belt. My challenge to myself was to shoot a game from a different prospective. I thought back to my college days in the mid-90's, when I had zero budget for camera gear. My idea was to shoot from a worm's eye view. The GoPro Hero 4 isn't exactly the ideal camera for the NFL, but you can tuck this thing in some unique spots to give a different view point of the game. I had the chance to photograph Jen Schefft from the Reality TV show "The Bachelorette" for US Weekly Magazine on her wedding day in Chicago. Below are a few images published in the magazine. We had one hour to photograph Kelvin Beachum JR current Tackle for the New York Jets. Images were used for Kelvins off season promotional key note seminars. At the time of the photo shoot Kelvin was a member of the Pittsburgh Steelers. Basic light setup with umbrellas and soft boxes, along with pocket wizards. Spending a few days in Arizona photographing a bunch of NFL players in the off season is always fun. On this particular day, I captured Super Bowl Champions Ryan Clark, and Max Starks of the Pittsburgh Steelers along with Paris Lennon of the Arizona Cardinals. On these types of shoots I like to photograph with one camera body using a 50mm, or 70-200mm 2.8 lens. I like to set up 2 speedlights with pocket wizards to bounce the light as needed. The best way to experience Hawaii is being invited by one of the best NFL players in the League. Pro Bowler Antonio Brown of the Pittsburgh Steelers flew me out to Hawaii to capture his first year as a Pro Bowler. Here are a few images from that trip photographing Antonio along with Mike Wallace now currently with the Baltimore Ravens. Evolution Sports Institute (ESI) is a premier training facility for Professional Athlete around the country. On this day I had a chance to photograph Super Bowl Champion Willie Colon. Currently Willie is retired from the New York Jets. In the images below, Willie was with the Steelers training to recover from a season injury. "A Day in the Life" with Pro Bowler Antonio Brown of the Pittsburgh Steelers, and Terrell Pryor of the New York Jets. I spent the weekend in South Beach Miami to see what it takes to train, and to have fun in the off season. Just another Saturday shooting NCAA Football. I love trying to photograph games in a different view point. So on this afternoon, I used the GoPro Hero 4 to snap pics at low angles, for the best view point. This little camera was so much fun to use during the pregame announcements. In a matter of a weeks my image of Johnny "Football" Manziel was trending on the @NFL social media sites. First because he was announced as the starter. Second because he was demoted to third string. Third, he was released from the Browns, and now out of the League. Big Ben & Antonio Brown during training camp. Just another sample image published in Sports Illustrated.